This is one of my favorite ways to enjoy spinach or watercress. Similar versions are often served along-side Japanese Teishoku dishes and in bento box lunches. Don't skimp on crushing the toasted sesame seeds, this is critical to the flavor of this dish. Order Best of the Best Hawaii Recipes - Look no further for the local recipes you love and crave. 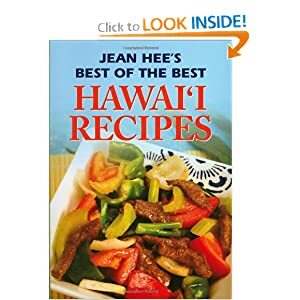 Jean Watanabe Hee has handpicked the most delicious, can't-miss dishes from her five Hawaii's Best cookbooks and put them into one handy volume - complete with a few new recipes you won't find anywhere else. In a large saucepan over medium heat; parboil spinach in salted water. Immediately transfer into ice bath. Drain well, squeezing out excess water. Cut into 2-inch pieces. In a mortar with pestle or in a suribachi (Japanese mortar) grind toasted sesame seeds. In a mixing bowl; combine sesame seeds with dashi, soy sauce, sake and sugar until smooth. Taste for seasoning, adding additional soy sauce and sugar as needed. Optional to toss spinach in sesame mixture or top spinach with mixture. Good on watercress or cucumber as well. Serves 4-8, sometimes 2.